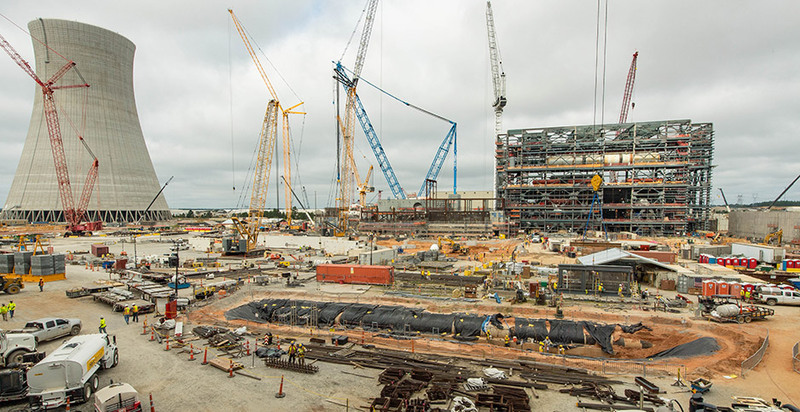 Construction at Plant Vogtle near Waynesboro, Ga., is seen in this August photo. Georgia Power Co. The future of the nation's lone nuclear construction project remained unclear last night as its utility partners continued to negotiate over how to handle its rising costs. Expenses at Southern Co.'s Plant Vogtle expansion project have jumped $2.3 billion in just one year. Vogtle's budget is roughly double what it was a decade ago, but the reactors were at a crossroads Monday when one of the business partners said it would walk away unless the construction costs were capped. That talks among the developers — Southern's Georgia Power Co., Oglethorpe Power Corp., the Municipal Electric Authority of Georgia (MEAG) and Dalton Utilities Inc. — have been extended until 5 p.m. today is a sign that they are trying to keep the reactors going. That is a far cry from yesterday, when Oglethorpe and its utility partners aired their disagreements — and anger — in lengthy public statements. 2008 Georgia Power Co. and three public power companies sign a contract with Westinghouse Electric Co. LLC to build two nuclear reactors, the nation's first in three decades. The total price tag is $14 billion. 2009 Georgia Power gets approval from the Georgia General Assembly and Georgia Public Service Commission to build the project, known as Plant Vogtle. The reactors will be finished by 2016 and 2017. 2012 The Nuclear Regulatory Commission approves the license for Vogtle and for a South Carolina nuclear project. Contractual disputes between Vogtle's utility owners and contractors begin, leading to lawsuits. September 2012 Vogtle is roughly six months behind its original schedule. February 2013 Georgia Power announces a 19-month delay at Vogtle. January 2015 Georgia Power announces an 18-month delay at Vogtle. Unit 3 will be finished around the second quarter of 2019, and Unit 4 one year later. October 2015-October 2016 The electric companies settle lawsuits with contractors and subsequent issues with the Georgia PSC. Vogtle's new completion date is the end of 2020. March-July 2017 Westinghouse files for Chapter 11 bankruptcy reorganization; Southern Nuclear and Georgia Power take control of Vogtle. August 2017 Georgia Power tells the Georgia PSC that it and the co-owners want to finish Vogtle. The new price tag is $23.4 billion, offset by a payment from Westinghouse's parent. Reactors' new operation deadlines are November 2021 and 2022. December 2017 Georgia PSC signs off on Vogtle with conditions. August 2018 Southern announces $2.3 billion cost increase, reaffirms November 2021 and 2022 construction dates. Owners must reaffirm commitment to project by late September. Sept. 24, 2018 Georgia Power and Dalton Utilities already agreed to move forward. The Municipal Electric Authority of Georgia affirms in a vote midday. Oglethorpe Power Corp. gives conditional approval and calls for a cap on future construction costs. Sept. 25, 2018 All utility partners agree to extend a negotiation deadline to 5 p.m.
For roughly 24 hours, the only thing that was clear was that Oglethorpe and its business partners appeared to be at an all-out war with each other. The main casualties would be Vogtle and the nation's already fragile nuclear industry. This is not the first time Vogtle's fate has hung in the balance. Its main contractor, Westinghouse Electric Co. LLC, went bankrupt last year, leaving the project's owners to decide whether it was worth shepherding the reactors through while taking on considerably more risk. Southern's nuclear unit and Georgia Power took over as the main contractors and presented a new cost and schedule. What was once a $14 billion project that would be finished in 2016 and 2017 had morphed into a $23 billion one with deadlines of 2021 and 2022. The costs rose again a year later. Georgia Power also maintains that it can meet Vogtle's new deadlines but has been public about challenges in hiring enough craft workers to meet aggressive production schedules. Because time is money, any type of schedule slip would be costly. And even though Vogtle's progress has improved significantly with Southern at the helm, the project remains highly complicated and still has years to go. This means the uncertainty that costs can be controlled remains high despite assurances from Georgia Power, its outside consultants and Bechtel Corp., which is a key contractor in the project. Southern announced the $2.3 billion increase during its quarterly earnings call in August, and Georgia Power said it would absorb its share. Because the budget increase was more than $1 billion and Georgia Power elected to eat the new costs, it triggered a requirement for the other owners to reassess their positions on the project. All of the partners had to vote by casting a ballot by Monday. Georgia Power and Dalton Utilities agreed in August to go forward. MEAG's board also unanimously agreed by Monday afternoon. Oglethorpe issued a conditional vote of support Monday night. But it called for a cost cap on anything above the $2.3 billion and an $800 million contingency. This is because Oglethorpe, as well as MEAG and Dalton, is a public power utility and does not have shareholders who can absorb a budget increase. All of the extra dollars continue to flow through to customer bills. Georgia Power, MEAG and Dalton pushed back in sharply worded statements late Monday night. Oglethorpe was making unreasonable demands and not accepting its previously understood risk in the project, they said. All three were ready to place blame on Oglethorpe, saying Vogtle would be canceled if it did not vote to go forward. This meant that thousands of jobs, the state's economic future and the chance to have emission-free baseload electricity were on the line. Oglethorpe fired back yesterday morning saying it had a duty to protect its members, electric membership cooperatives, and their customers. "We believe we are being common-sense protectionists ... regardless of tremendous business and political pressure because it is simply the right thing to do," the utility said in a statement. Indeed, everyone from Georgia utility regulators to state lawmakers to the Energy Department had stepped out on the line in one way or another to support Vogtle at some point. Eventually, Vogtle's future turned into seeing a troubled nuclear project through a variety of contractor and vendor problems, delays and cost increases to ensure a political and emotional victory for some stakeholders. Developers agreed to negotiate until 5 p.m. yesterday. Georgia Power and Oglethorpe announced an extension until 7:30 p.m. and then 11:30 p.m. "in order to continue the progress being made on reaching an agreement to move forward with construction."